Vintage Pattern Enabler Alert ! Ho Ho Ho...Merry Panic ! Tutorial-- Quick, Easy, Draped Cowl Variations ! Here's a "Custom Turn" on a technique many of you may already use to finish the outside edge of a facing. In this short tutorial I am demonstrating this method on the front facing of the Negroni Camp Shirt Pattern. The photo above shows the facing pattern cut out as usual on the CF edge (to the right), BUT cut about 1/8" wider on the curved outer edge (the edge my scissors are "pointing" to). Next cut out your interfacing using THE CUT OUT FABRIC FACING PIECE for the INTERFACING "PATTERN" (I am using one of my custom-milled interfacings, Pro-Sheer Elegance Fusible Interfacing available exclusively at Fashion Sewing Supply). Then, place the Interfacing and Fabric Facing piece RIGHT SIDES TOGETHER (the fusible side of the interfacing will be "up"), and stitch them together with an 1/8" seam along the curved edge. If you click the photo above to enlarge it, this stitching is more visible. Now, open up (separate the 2 layers), and move the piece to your pressing surface. 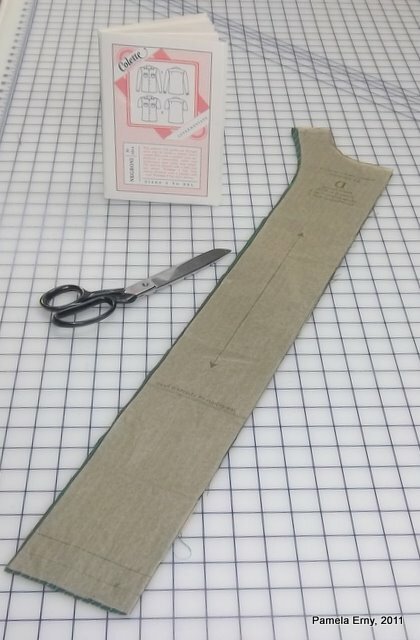 At your pressing surface, turn the interfacing to the wrong side, WRAPPING the interfacing OVER and AROUND THE NARROW SEAM, enclosing the seam allowances. Now fuse the interfacing according to the instructions. Please note--The interfacing will not reach the long straight CF edge of the facing..and this is a good thing...no added bulk in that seam when it is later sewn ! The photo above shows the completed "Clean Finish" of this facing. 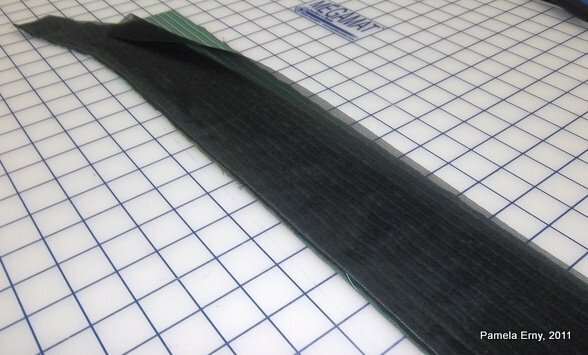 Usually when the basic method of this technique is used, the allowances of that little seam are completely turned to the wrong side, then the interfacing is fused to hold them down. However, when the seam-allowances are WRAPPED by the interfacing, they are not only clean finished, but thin and bulk-free. And the added bonus is that when the shirt is completely sewn, it will look like flat piping has been sewn to the facing edge. This is such a nice custom look without the bulk that would transfer to the right side as a wrinkle/ridge every time the shirt is pressed ! I love this technique! Really finishes off a facing! I have been using this technique for years, but your variation is much better than my way. Cool. Thanks again for adding to my sewing repertoire. This is such a great technique - I've used a similar technique for years, learned it back in HS. I'll have to try this wrapped edge version, different and I like the piping effect. Thanks for the explanation. Never used this technique but will now. I learn so much from your tutorials. Thank you! Great! Very neat and professional - thanks for sharing! Oh that's very nice. I like the finished *piping* edge on the inside. Your tutorial makes it very clear - thank you! Pam you are a GENIOUS ! Why didn't I ever think of that?!? I'll use your tutorial this week. Very cool! I often make bias bindings on the curved seams of facings but for shirts I didn't want the bulk and only ever used serged edges until today. This is so much better. Thank you for sharing it wiht us. This is a great technique, Pam. Making my Negroni muslin, I interfaced with my fashion fabric, and then to finish the edge I folded over twice and stitched, as directed. We're now talking 6 layers of fabric. The thick seam showed through the front of the shirt. I had to serge it all off -- not perfect but better. I'm working on this pattern as well, please let me know how you work the yokes! I did it the Kwik Sew 2777 way. I spoke to Peter and he said he's going to hand sew the gap. Hi Sew Sister, When making a camp shirt like the Negroni with a convertible collar + yoke, I close my yokes and collar a totally different way, all done by machine...(with all raw edges enclosed...a tiny gap secured during the edge-stitching, after all is turned)which I may detail and offer in a tutorial in the future. I took a quick look at your blog, and your Kwik-Sew method would have worked just fine, if you had sandwiched the collar between the yokes and sewn the neck-edge. While I adore Peter and think he is quite talented, he is still learning :) IMHO, hand-stitching any gaps during ShirtMaking is a 'loving hands at home' technique...and that may be just fine for some (no judgments here). Forgive me I cannot go into any more detail now, as I am just back from surgery. OK..hold on. I just checked Sigrid's Tutorial Blog, and saw that my dear friend Gigi (Behind the Seams) sews a convertible collar w/yoke almost the EXACT same professional way that I do! Here is the link to her excellent tutorial..you'll never have to hand-stitch a gap again! This Tutorial is worth it's weight in gold, please leave a comment for Gigi when you visit, and credit her if you pass the link to Peter or others, thanks. OMG Pam, I hope the surgery wasn't too serious, get well soon!! !